My next cabin in the woods! What a cool idea – a house built with a few pallets, 2×4’s and labor. Hopefully the link remains active more than a few months. I would like to scrape a few of the pictures from the link just to entice those reading this missive to go to the link for a look. As promised, I was there at 1000 hrs ready to help take Nanita to her new home in Clearwater. The Pelican poo on the dock was horrendous and the place on our pier head wreaked of the stuff. On arrival at the boat I found the stuff tracked everywhere. The Captain mounted a valiant effort to clean up – to my benefit – and soon the richly sweet smell of Pelican poo was a distant memory. However, it clung to the decks and cabin sole like glue but the stuff was cleaned up by the time we cleared Boca Ciega at the Gulf pass. What a beautiful day it was as we passed St. Petersburg Beach, Treasure Island, St. John’s Pass, Indian Rocks, et.al. on the way to Clearwater Muni. I spent a good deal of this calm time to right all the bogus pages and settings previously made while other people made attempts to learn the system. I think it was finally ok and I did it without resorting to factory defaults. I was a little ticked that someone other than the captain made these changes to fundamental system system settings but all turned out well. The final approach into Nanita’s slip was uneventful and made by the Captain. Upon arrival we made sure she was resting nicely in her new home and then prepared to depart Nanita while we waited for the Admiral to arrive to take me back to the mundane life of a landlubber. It is a sad day for me but with a fun trip and memories to support my continued steps forward. Thanks to all that made this possible. insisted on sleeping after 0000 to 0400 & 1200 to 1600 hrs shifts I assigned myself. Tempers flared but nothing major but the tension was palatable due to excessively loud music being played by one crew member. Enough of that! Sometime during my 0000 hr shift the wind piped up to 15 kts with gusts to 18 kts and finally a steady 18 kts 60 degrees off the port bow. It was time for sailing: first out came the full main and then jib. That was the time all Hades hit the Nanita. With Nanita idling and a forward speed of about 1.5 knots she heeled over to about 35 degrees and spun to the starboard. At this point, I applied lots of rudder but it was not too effective and the boat kept turning to starboard almost to the point of a jibe. With the sails de-powered but a little more speed the boat started to turn to port and with this speed it passed through a beam wind with corresponding heel but at least we had a little speed and I got stopped turning just as we passed thru dead into the wind and started a back-wind to the sails. I nudged it to starboard slowly, accompanied to flapping sails but ast least we were stabilized and the speed built. Meanwhile, the Captain was trying to reef the main but it was not cooperating and we called up the off duty crewman to help as Capt went to the mast to use the emergency in-haul to pull in the sail. 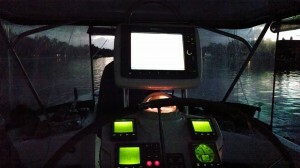 The jib was then reefed and the boat was in perfect trim and on went the autopilot. In the moment of adrenalin induced rush there was a lot of yelling but the moment of nighttime terror was over. 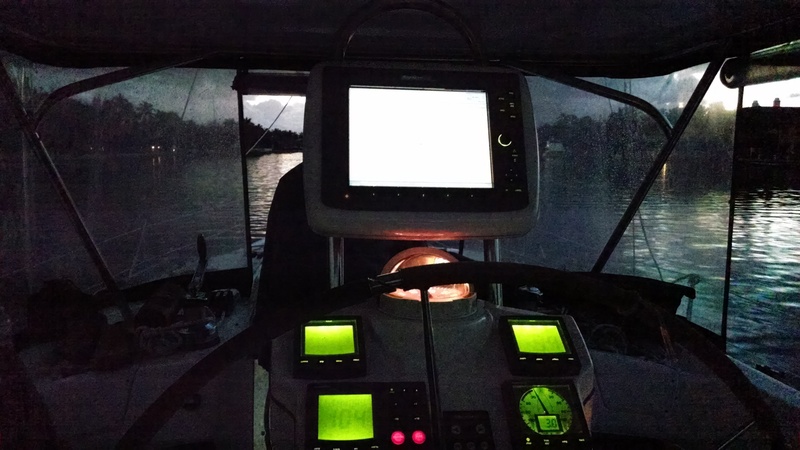 The rest of the night was uneventful except the blaring music below as the off duty crewman learned the chart plotter system and made a point. During this night and about 0500 ( I was on duty until 0600 since the off duty crew did not show up for the shift) I told Captain I wanted off the boat and he said Boca Grande was the first place for me to get off. It was about this time that we discovered a broken boat that cause our main sail reefing issue. We were heading for Boca Grande now for sure. I went off duty as the crew shift came on duty and layed down on the salon port settee wedged between the table and the settee. I had a fitful sleep but felt rested in a couple of hours. That was about the time the on-duty crew came down and said a new day was dawning and that he was getting off the ship. We were still heading for Boca Grande as I could see from what remained of the below deck chart plotter page. I went up to Captain to find out what was going on and he asked me if I was getting off too. I was a bit surprised since I was the one who was supposed to depart. Captain needed at least one crew to help get the boat home so I said I would stay but went below to finish packing just in case the fluid situation changed yet again. As I came back up to the cockpit the wind was still about 60 degrees off the port bow but this did not last long! All of a sudden – in a few seconds – the wind clocked around to dead upon the bow at 35+ knots and the seas started to build and build. It is hard to really tell how big seas really are but they seemed large and were about 6 – 8 confused and steep. We were getting slapped around quite a bit but were in no real danger as the jib had been rolled up a few minutes earlier. The main was left partially furled because we did not want to tempt fate messing around a broken rig but since the wind was dead upon the nose all we had to do was tighten the sheets and Vang. The Hunter would rise to the waves and then slam down the other side as the broad bottom hit (sort of like a ski boat crossing rough waters). The time passed slowly but we were making progress into Boca Grande pass and finally were in calmer waters. By the time we headed for the first marina the water was calm but the wind was still about 15 kts. As we entered the marina everything was calm and we had no further issues. The crewman departed and we filled ourselves with fuel and departed the marina. We attempted to anchor, in a stiff breeze, in a little cove where some other sailboats were anchored with stern end tied to mangroves and anchor off the bow. We could not seem to get the Delta anchor to grab, probably our fault, and after 4 tries gave up and started up the intercoastal towards Venice. 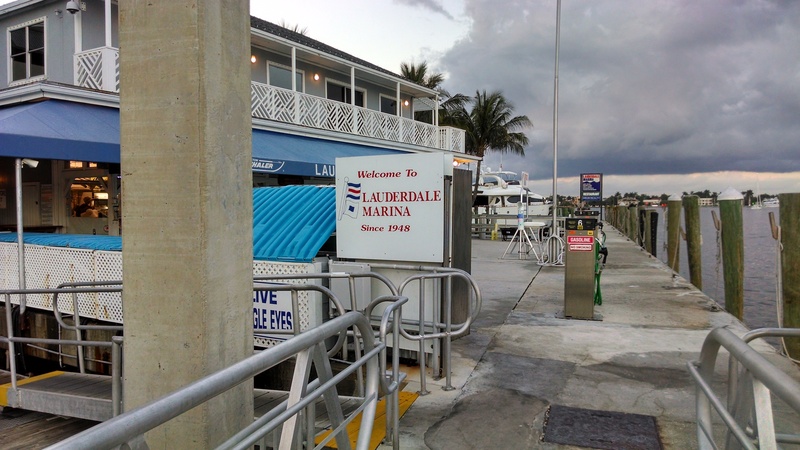 We had had our excitement for the day so as we passed a nice looking marina (name here) we called and they said they had room at a convenient pier so we reversed course and returned to this great little spot with shore power, restaurant and full amenities. This was a wise choice as we were in dire need of sleep. After a nice meal we hit the bunks and were dead to the world until 0530 hrs the next morning. Being renewed by sleep we charged into the day with a 0630 departure that was uneventful. We were headed towards Venice and Tampa Bay. 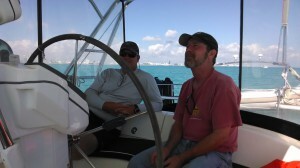 We took turns at the helm and I learned a lot about inter-coastal Florida navigation along the way. The trip to Tampa bay was uneventful, beautiful and sort of boring when I was not at the helm. Somewhere in the process of getting to Tampa Bay we knew we were pushing the time of closing of the Gulfport Marina so we made reservations and the dockboy gave us instruction as to how to find our berth. Crossing Tampa Bay from the Manatee River mouth to the West side of the North shore at St. Petersburg (near the Sunshine Skyway West of the Bridge and at the North end) we entered the channel to Boca Ciega Bay. The waters were at almost low tide and were dangerously shallow at the green marker 1 but we made it into the channel with only a small incident and the Captain did a fine job of getting around the potential situation. At this point we knew we would be arriving well after complete darkness and we took our time in these shallow waters cruising about 3 kt or less. 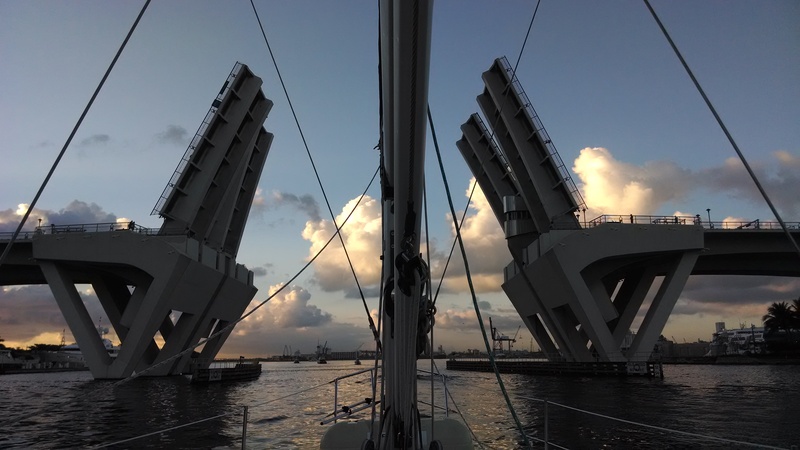 We were very tired as we cleared the last bridge into the bay and started the complex maneuver into the Gulfport Marina in Boca Ciega Bay. We proceeded very slowly, zigzagging the channel looking for the “range” lights of the marina. 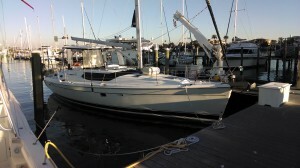 However, once found it was obvious the course to take into Gulfport Marina. A picture perfect instrument approach arrival was made and soon we were tied to the dock with all lines secure. Since were so close to the place where I stay in the winter, I had SAM pick me up and I stayed the night at home while the Captain stayed aboard. With promises to return at 1000 hrs tomorrow and a complicated scheme of lowering the dingy and rowing me across to the gas dock I was soon home asleep and dreamed of big waters and rocking in my bed. Thus ends Phase two of the trip. Nanita has wonderful electronics that would make you drool. Not everything I would want but most of it. We left St. Petersburg at about 1200 hours on Monday 10 February for the three or four day trip and drove via rental car to the marina in Fort Lauterday Marina. We were to meet our professional Captain named Jeff at the boat for the trip to Marathion Key at which point we were supposed to be proficient at running the boat. Our first mistake was to not start the boat on arrival because when we did start it at 0530 hrs 11 Feb 2014 the red alternator light would not go out no mater what the RPM. The trip from the marina to the Atlantic took about two hours and required many bridge openings to get there. We stopped for fuel at the (marina name lookup) and filled the fuel and water tanks as well as getting some coffee. After that it was out to the open seas, perhaps 7 miles out, but not far enough to hit the Gulf Stream that would slow us down. The intent was to get into some eddy that would propel us faster to Marathon Key. This did not happen and it was pretty much 5.5 knots all the way. The more we learned about the electronics the worse it got. Nothing was charging – even with the onboard genset – so we were running on batteries the whole time (24 hours). I know the Link 2000 system and the Xantrex 2500 system from my boat and nothing made any sense as to why there was no current going into the batteries with either the engine and genset. We motored the whole way and Capt. Jeff ran the boat the whole way so the crew did not get any experience at the helm – a mistake that later was to cause and issue or two. We motored all day and all night in endlessly calm, boring waters down to Marathon Key arriving in treacherously shallow waters into Marathon Key Marina and we docked at the gas dock waiting for sun up. Everyone hit the bunks for some sleep and after waking up we all went to breakfast and by prior arrangement Jeff departed with his SO for the Miami Boat Show. This left us with the problem. I was pretty sure the Alternator was bad so Capt. Kim hired SALT to check things out, at $100/hr, and Fernando came up with the same verdict – a bad alternator. 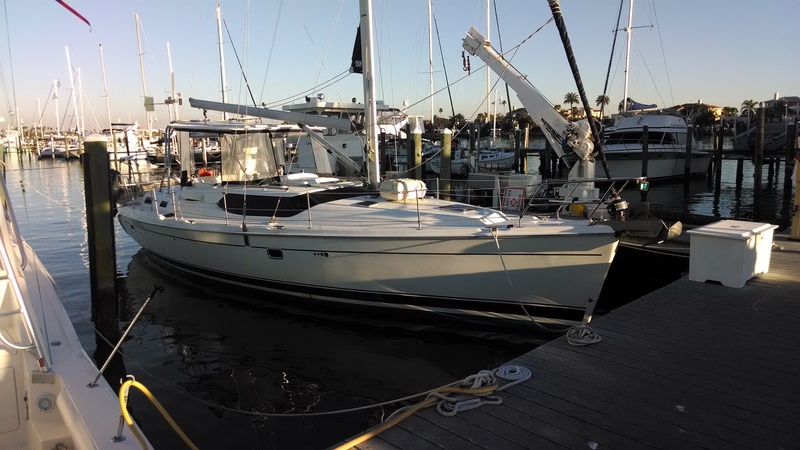 After much discussion and deliberation the Captain decided to spring for the replacement alternator which was a Balmar 100 A unit at $800 plus labor. After installation on day two in MKM things were pronounced AOK so we planned our departure for the next morning just after sun up. Later in the day, I discovered more gremlins in the electronic system because the Captain was messing around the subterranean wires I saw the charging rate go from normal to abnormal rates and voltages . Dock power was not charging us nor was the genset nor the alternator. I looked around at length and after much discussion, Captain decided to delay departure because something was wrong that he wanted fixed. This was the correct decision. As I was checking around the wires that morning early I discovered a lose main buss wire – bingo! In the morning we called SALT and Fernando came out pronto and took apart the panel that I did not want to tackle without my tools and found a major loose main buss wire. He tightened it and the generator and genset were charging ok. Time to go! 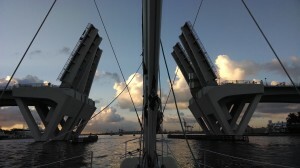 Fernando was paid and we were fueled and watered up and blasted out of Marathon Key at 6.5 knots for the Moser Pass, under the bridge back towards the East and the left hand turn into the Florida Bay. And so ends the electrical problems of this trip and so ends this phase. Ok ok, I am a bad boy. I never update my blog. However, in my defense I (weZ) have been pretty busy this winter. Somewhere after New Years day we blasted off the frozen upper North en-route to Rock Hill, SC to see my aging aunt, the last surviving aunt, and arrived the same day we left. The entire trip was in brilliant sunshine but very cold for the whole trip. In fact, the night after our arrival, it was 9°F in SC! We had a good visit and got to visit the twins building for the first time. Too soon we had to leave for FL. We arrived in FL after another good days travel and started the unpacking job – which was done in great disarray up North – and setting up for the time allotted for us here in St. Petersburg. We did not forget to bring too much but that which was forgotten was sorely missed. At the time of this writing we have found the missing video camera but seem to have lost the Kodak still of SAM’s. The ham radio is up and running and we have contacted W9LKI many times and found a great IRLP site run by W3RX (node 8676). We spent the first weeks cleaning up the backyard of all the thorny bushes, hibiscus and other vining junk and it now looks good again but M says it looks bare. The pool is in great shape but needs a bottom repair and sealed at the upper level to reduce water leaks. Our first big event of this season was Hamcation in Orlando. This is the 2nd biggest ham radio event in USA. We took the camper over and parked next to W9LKI on cement for Friday and Saturday nights. NOTE TO SELF – next year plan on being there on Wednesday so as to get next to a power pole down by the lake (in this case we would stay W, Th, Fri nights and go home on Saturday). The weather was lousy and rained the whole time except Sunday morning and lots of vendors left. I bought a green laser pen for use on the boat to light up the channel markers (a bad idea as it almost blinds you with the reflection) and bridges. The pen sort of works but is much more dramatic when you point it at a star – it is like a guiding light to the heavens. Also bought some mic clips so I can finally hang the mic instead of laying it down. I was invited to help Kim deliver his boat from Ft. Lauterdale down to Marathon Key and then on thru Florida Bay and, finally, up the coast to Clearwater Muni Marina. 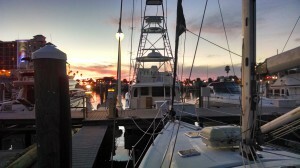 Along the way we were 3 days in Marathon with boat electronic issues, one night at Boca Grande and finally the last night in Gulfport Muni Marina. The whole trip was filled with surprises, tension and and storms of various magnitudes. The trip can be broken down into three pases and each will be discussed below as three paragraphs. I want to thank Darrell for his introduction to Kim, the Captain, because without that, I would never have known about the trip nor been invited to join. The whole process took 7 days and this was three days longer than expected. The number one lesson learned was to enforce the shift schedule: the macho dudes of this trip thought they could do with out sleep and things go ugly before they got better. The number two lesson was to install line cutters because there are hundreds of thousands of crab pots on the path we took. The third lesson was to not absolutely believe the chart plotter for depths. With these in mind we will go into the voyage of the Nanita, a 45′ Hunter of 2006 vintage.